Conquer and reinforce several subject matters in an interactive manner that your students will appreciate. This mastery game set of 12 double-sided and laminated game boards induces learning with a total of 750 questions that are standards based to conveniently go online with your state guidelines, with 30 review cards per topic divided into 25 topics. 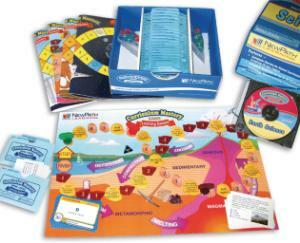 A comprehensive teacher guide is included as well as a CD that is whiteboard compatible featuring interactive flash cards. WARNING: CHOKING HAZARD - Contains small parts. Not suitable for children under 3 yrs.